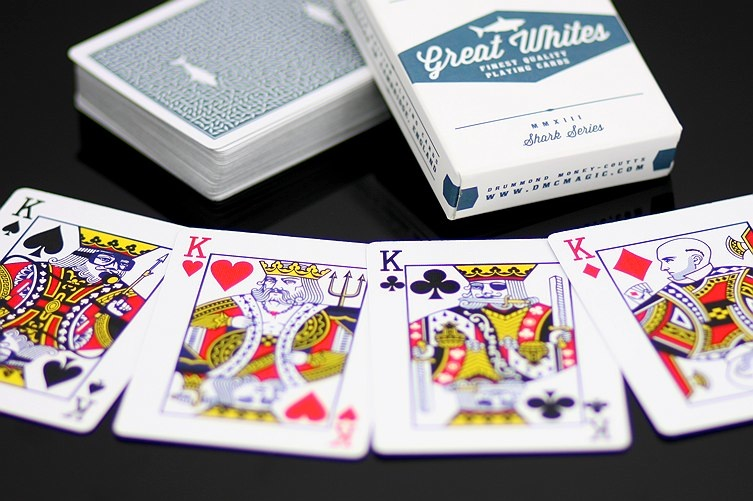 The new Great Whites deck, available with our unique marking system PLUS the last days of our fantastic competition. 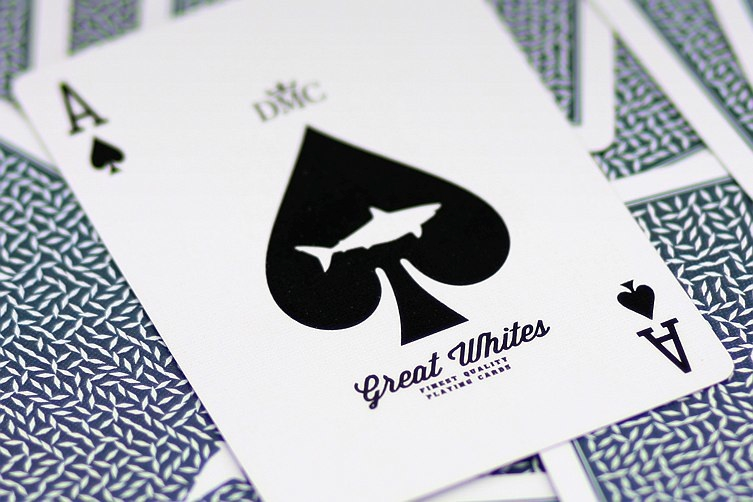 Introducing the new Great Whites deck, designed by Phill Smith in collaboration with TV Card Shark Drummond Money-Coutts, available as both a standard deck AND a marked deck, featuring a unique and highly visible marking system with clear marking and zero ambiguity for a fast and reliable read in the heat of a live performance. The deck oozes old-school cool with a great feel, a subtle design that looks great in play, custom kings, Jokers with a smart revelation built in and a marking system has to be seen to be believed. Printed CMYK & Plastic Coated. Box Material: 395um Zanta Box Board. Moleskin Laminated. To celebrate the launch of the deck were are also running an incredible competition: On the 1st October we will be taking the names of everyone who has ordered the deck and randomly selecting one person. We will contact this winner and Sovereign Playing Cards design studio will design and print an amazing, unique one-off deck to their exact specification. This deck will never be made available to the public and will exist only as an incredibly exclusive super-limited run, the ultimate collector’s deck. But hurry, time is ticking! ALI BONGO CLOSE UP MAGIC MICRO MARATHON for The Ali Bongo Memorial Trophy. If you have never heard of the Evasons, you will – very soon. That’s because Jeff and Tessa Evason are coming to STIMF 2014 to perform their incredible brand of mind power, and it’s a show that generates a great deal of amazement – and enthusiasm. Since 1983 the Evasons, who are based in Toronto and Annapolis, have astounded audiences the world over. Their performance is a mind-blowing repertoire of paranormal feats. Audiences react with wide-eyed wonder when Tessa and Jeff demonstrate their skills in ESP, telepathy, super memory, prediction, telekinesis and levitation. This slick blend of interactive demonstration, comic relief and spellbinding entertainment is definitely not a magic show. There are no gimmicks, no wires, no hidden microphones. In fact, the Evasons offer $100,000 to anybody who can prove otherwise. The experience defies explanation. And maybe that’s why the crowds go wild at every show. There’s never a dull moment for Jeff and Tessa, who spend much of their year on the road entertaining audiences at college or corporate events, theatres, cruises or casino showrooms. It’s no wonder that Siegfried & Roy named The Evasons their favourite act, awarding them the prestigious SARMOTI Award at the World Magic Seminar in Las Vegas. They are a class act, recognized by their peers and fans alike as the finest mentalist duo in the world. Their stylish presentation and stunning showcase of talent has also earned them the distinction of being the Psychic Entertainers Association’s Performers Of The Year. Amidst rampant Facebook and Twitter speculation, Sorcerers Summer Safari Magic Camp just announced bringing in famed Las Vegas-based Magician Justin Flom as the special guest at Camp this summer. With several best selling DVDs, a cover of IBM’s magazine and a ton of great unpublished ideas – Justin Flom has lots to offer the campers. Famous for his Ellen appearances, Justin Flom’s YouTube channel has also received international acclaim. The campers are going to love him! The idea of having the ‘rising stars of magic’ as special guests at camp is always one of the hot debates at the annual executive staff meetings. Sorcerers Safari Summer Magic Camp chooses only the best of the best to come up as their special guest. After unanimously agreeing Justin Flom was a perfect fit, they asked and he gladly accepted. According to Mike Segal, Sorcerers Safari grows exponentially with a high rate of return campers and staff. With luck, Justin Flom will love camp so much, he too, will return every year. The IBM/SAM 2014 Combined Convention has posted the Competition Rules and Contract for the FISM 2014 North American Championships and the I.B.M. and S.A.M. Contests of Magic on the convention web site. Contest rules have been prepared to reflect the requirements of the FISM Presidium. All those who are considering entering the competition in 2014 should consider these instructions required reading. A potential of fifteen residents of North America will have the opportunity to compete at the 2015 FISM World Championship of Magic to be held in Rimini, Italy. In addition, all contestants, regardless of residency, will have the opportunity to compete for I.B.M. and S.A.M. awards – plus performing contracts. To date, the following conventions have committed to inviting contest winners to perform: Abbott’s Get-together (USA), Blackpool Magic Convention (England), Club Magico Italiano (Italy), Columbus Magi-Fest (USA), El Duco Magic Weekend (Sweden), Fechter’s Finger Flicking Frolic (USA), MacMillan’s International Magic Convention (England), Sindelfingen International Magic Festival (Germany), Society of American Magicians Convention (USA), Winter Carnival of Magic (USA). Registration for the 2014 I.B.M./S.A.M. Combined Convention will reopen July 1.